Creating a charting application where a user can pick their visualization type. Should I name the chart type 'vertical bar chart' or 'column chart'? Bar chart Wikipedia entry says "The bars can be plotted vertically or horizontally". Column chart is sometimes used to mean vertical bar chart. Looking for something that users will understand easily. Each chart type will be accompanied by an icon. Both mean the same. But if you want something most people would be familiar with, follow what Microsoft Excel does. In Excel, they have (horizontal) Bar Charts and Column Charts. Together with the icon, it will suffice to most of your users. I'd suggest that people aren't even looking at the name, they're just looking at the icon. So make the icons bigger and the text smaller. If you do a Google Search for 'Bar chart', ~80-90% are vertical. So if someone is searching your help for 'bar chart' there is a 80% chance that they are looking for a vertical bar chart. So there's a good chance that your Excel users will understand that. 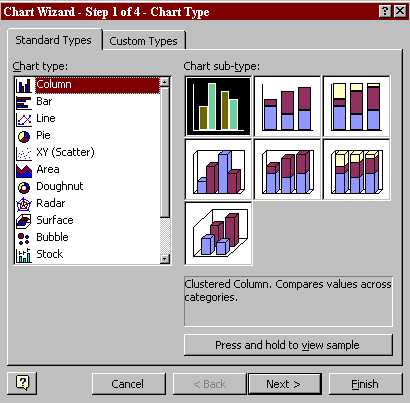 But from personal experience, I actually had no idea that Excel called them Column charts, even though I've been using Excel since the '97 edition! When and how can a floating column chart be useful?